Charles Spencer Chaplin was born in a poor district of London, England, on April 16, 1889. His mother, Hannah Hill Chaplin, a talented singer, actress, and piano player, spent most of her life in and out of mental hospitals; his father, Charles Spencer Chaplin Sr. was a fairly successful singer until he began drinking. After his parents separated, Charlie and his half-brother, Sidney, spent most of their childhood in orphanages, where they often went hungry and were beaten if they misbehaved. Barely able to read and write, Chaplin left school to tour with a group of comic entertainers. Later he starred in a comedy act. By the age of nineteen he had become one of the most popular music-hall performers in England. In 1910 Chaplin went to the United States to tour in A Night in an English Music Hall. He was chosen by filmmaker Mack Sennett (1884–1960) to appear in the silent Keystone comedy series. In these early movies ( Making a Living, Tillie's Punctured Romance ), Chaplin changed his style. He stopped overacting and became more delicate and precise in his movements. He created the role of "the tramp." Appearing in over thirty short films, Chaplin realized that the speed and craziness of Sennett's productions was holding back his personal talents. He left to work at the Essanay Studios. Some of his films during this period were His New Job, The Tramp, and The Champion, notable for their comic and sympathetic moments. His 1917 films for the Mutual Company, including One A.M. , The Pilgrim, The Cure, Easy Street, and The Immigrant, displayed sharper humor. In 1918 Chaplin built his own studio and signed a million-dollar contract with National Films, producing silent-screen classics such as A Dog's Life, comparing the life of a dog with that of a tramp; Shoulder Arms, which poked fun at World War I (1914–18); and The Kid, a touching story of slum life. In 1923 Chaplin, D. W. Griffith (1875–1948), Douglas Fairbanks (1883–1937), and Mary Pickford (1893–1979) formed United Artists (UA) to produce high-quality feature-length movies. A Woman of Paris (1923), a drama, was followed by two of Chaplin's funniest films, The Gold Rush (1925) and The Circus (1928). Chaplin directed City Lights (1931), a beautiful tale about the tramp's friendship with a drunken millionaire and a blind flower girl. Many critics consider it his finest work. Although movies had made the change over to sound, City Lights was silent except for one scene in which the tramp hic-cups with a tin whistle in his throat while trying to listen politely to a concert. Modern Times (1936), a farce (broad comedy with an unbelievable plot) about the cruelty and greed of modern industry, contains some of the funniest gags and comic sequences in film history, the most famous being the tramp's battle with an eating machine gone crazy. Chaplin's character of Hynkel in The Great Dictator (1940) is a powerful satire (the use of humor to criticize a person or institution) of German military leader Adolf Hitler (1889–1945). It was the last film using the tramp, and ends with Chaplin pleading for love and freedom. It was with these more involved productions of the 1930s and 1940s that Chaplin achieved true greatness as a film director. Monsieur Verdoux, directed by Chaplin in 1947 (and condemned by the American Legion of Decency), is one of the strongest moral statements ever put on the screen. Long before European filmmakers taught audiences to appreciate the role of the writer and director, Chaplin revealed his many talents by handling both roles in his productions. popular with European audiences than those in America. During the next five years Chaplin devoted himself to Limelight (1952), a gentle and sometimes sad work based in part on his own life. It was much different from Monsieur Verdoux. "I was … still not convinced," Chaplin wrote, "that I had completely lost the affection of the American people, that they could be so politically conscious or so humorless as to boycott [refuse to pay attention to] anyone that could amuse them." Further hurting Chaplin's image was a much-publicized lawsuit brought against him by a woman who claimed he was the father of her child. Although Chaplin proved he was not the child's father, reaction to the charges turned many people against him. While on vacation in Europe in 1952, Chaplin was notified by the U.S. attorney general that his reentry into the United States would be challenged. He was charged with committing immoral acts and being politically suspicious. Chaplin, who had never become a United States citizen, sold all of his American possessions and settled in Geneva, Switzerland, with his fourth wife, Oona O'Neill, daughter of the American playwright Eugene O'Neill (1888–1953), and their children. In 1957 Chaplin visited England to direct The King in New York, which was never shown in the United States. My Autobiography (the story of his own life) was published in 1964. Most critics considered Chaplin's 1967 film, A Countess from Hong Kong, a disaster. By the 1970s times had changed, and Chaplin was again recognized for his rich contribution to film. He returned to the United States in 1972, where he was honored by major tributes in New York City and Hollywood, California, including receiving a special Academy Award. 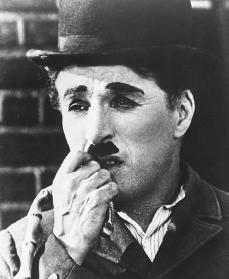 In 1975 he became Sir Charles Chaplin after Queen Elizabeth II (1926–) of England knighted him. Two years later, on December 25, 1977, Chaplin died in his sleep in Switzerland. All of Chaplin's works display the physical grace, ability to express feeling, and intellectual vision possessed by the finest actors. A film about Chaplin's life, titled Chaplin, was released in 1992. Chaplin, Charlie. Charlie Chaplin's Own Story. Edited by Harry M. Geduld. Bloomington: Indiana University Press, 1985. Chaplin, Charlie. My Autobiography. New York: Simon & Schuster, 1964. Reprint, New York: Plume, 1992. Hale, Georgia. Charlie Chaplin: Intimate Close-Ups. Metuchen, NJ: Scarecrow Press, 1995. Lynn, Kenneth S. Charlie Chaplin and His Times. New York: Simon & Schuster, 1997. Milton, Joyce. Tramp: The Life of Charlie Chaplin. New York: HarperCollins, 1996. Schroeder, Alan. Charlie Chaplin: The Beauty of Silence. New York: Franklin Watts, 1997.
the biography of charlie chaplin is intresting. i have read it more then 11 times. thanks. Can I get some information about his life after marriage ?? Would help me in my project on his life !! thank you !! He did not settle in Geneva! Get your facts right! He settled in Corsier-sur-Vevey near Lausanne.